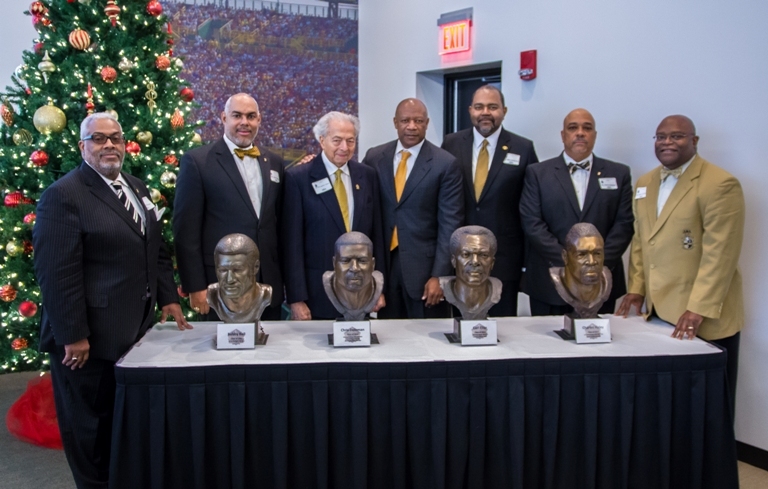 The Northeast Ohio Chapters of Alpha Phi Alpha Fraternity, Inc. – Delta Alpha Lambda (Alumni), Eta Tau Lambda (Alumni), Pi (College), hosted the 2015 Northeast Ohio Founders’ Day Luncheon and Program at The Pro Football Hall of Fame Event Center (PFHOF) in Canton, OH. The theme was – Alphas in the National Football League (NFL). There have been over 75 men of Alpha that have played in the NFL since its inception in 1920. Brother Hanford Dixon, who was a cornerback who played in the NFL for the Cleveland Browns was the program speaker. Approximately 125 brothers were in attendance including the 25th General President, Brother James R. Williams, Brother Willis Lonzer III, Ph.D., the Midwestern Regional Vice President, Brother Ronald Stovall, the Midwestern Regional Executive Director and Brother Larry McCrimager, the State of Ohio Director. Brothers were able to tour the PFHOF prior to the start of the program and afterwards. There was a reception prior to the program that included coffee and tea. The program started with a presentation on the Hall of Fame Village building program by Mr. Pete Feirle, Vice President of the PFHOF board of directors. The PFHOF placed at each table setting the 2015 PFHOF inductee members collection card set. Brother John Williams HTL President brought opening remarks and Brother Clarence McElrath President of DAL chapter introduced the dais. A three entrée catered buffet luncheon by the PFHOF caterers was served, as well as dessert. Brother Hanford Dixon gave a nice talk about his experiences in joining the Alpha chapter (Mu Xi) at Southern Mississippi University. He talked about how the lessons learned shaped his life and attitude towards commitment in the National Football League. A question and answer period with the attendees added much laughter and interest to the program. A video tribute celebrating the Founders, the leadership of Alpha and the deceased Brothers of the past year was shown. Brother Tony Dunlap created the video. Brothers Larry McCrimager and Ricardo Myers conducted the Omega Service. Closing remarks were brought by the 25th General President, Brother James R. Williams.